You might be wondering what is a “bounce rate” in the first place? A bounce is a single-page session on your website. When a user lands on your website and leaves without performing a single action (zero engagement), the session is classified as a bounced session. 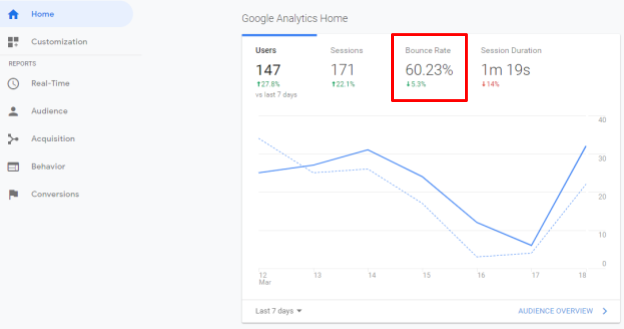 Thus, bounce rate is the percentage of all sessions on your website in which users viewed only a single page and triggered only a single request to the Google Analytics server. Let's break this down in practical terms. Your content doesn't match what the audience is looking for. The visitors have found the information they were looking for and have no reason to engage further. Item #3 shows that having a high bounce rate may not always be a bad thing. But a high bounce rate is usually an indicator of other underlying problems that need attention. The bounce rate can be seen in several places in your Google Analytics account. Home: See the overall bounce rate of your WordPress website. Behavior > Site Content > All Pages > Bounce Rate: See the specific bounce rates of various pages on your WordPress website. Despite what many search marketers say, bounce rate is not a ranking factor for search engine optimization (SEO). Google clearly states that it does not consider your Google Analytics data. But, bounce rate can impact your ranking indirectly, as described in this article. This means that you should reduce it as much as you can. To reduce bounce rates, review your search users journey from the moment they see your website in the SERP results, to what they see and do when they land on your web page. 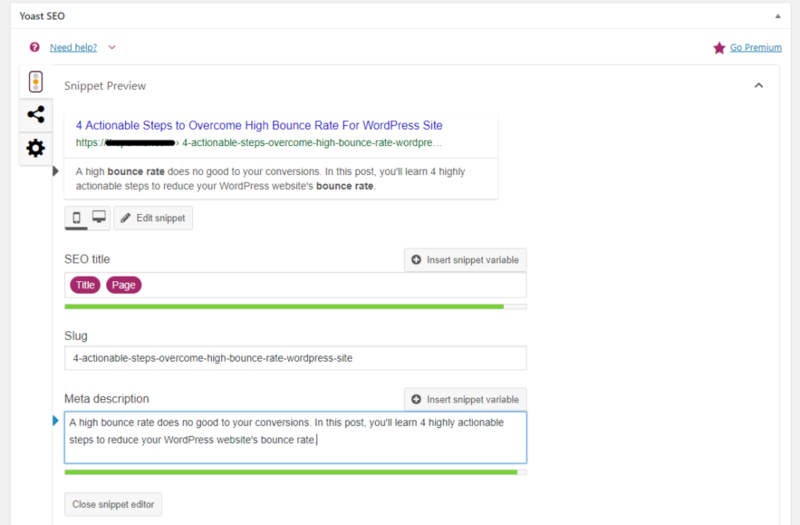 Here’s a step-by-step approach from the user’s perspective to overcome a high bounce rate for your WordPress site. Slow site speed is the number one reason for high bounce rates. If your page loads slow, users will hit the back button and look for another website. How do you optimize your site speed, you ask? Start by running a speed test with a tool like Pingdom to analyze what could be causing you problems. Now that you have the analyzed what's causing your website to load slow, you can start taking actions to fix it. 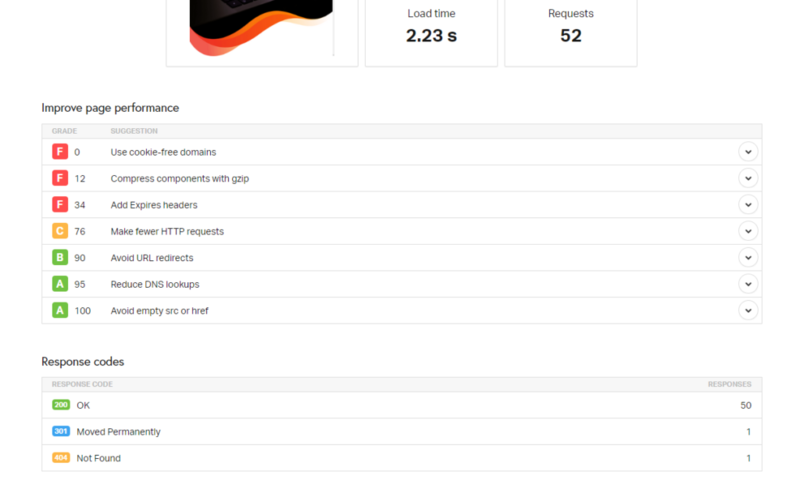 Here are some interesting tips on how to test and interpret WordPress site performance with WordPress developer wizard, Jon Brown. You have worked hard on your SEO and finally reached the first page of Google for your desired keywords. This will only result in short-term gains. What you should aim for is to get is qualified visitors: the visitors who land on your page because it suits their requirements and solves their problems. You can use the Yoast SEO plugin to help tailor the perfect title and meta description for your content to attract the right visitors. Go back to all the pages on your website and review their SEO titles and meta descriptions for relevancy. Clearly explain what the user should get from your content when they click through to your website. This new information will appear in the search results, so only qualified visitors will land on your website. This eliminates unnecessary visits to your website, which reduces the bounce rate. To help reduce the bounce rate from other sources of traffic, such as social media or email, make sure the content and call to action are genuine and accurate as well. Users browsing on mobile devices constitute more than 50% of your website traffic today. This means that ensuring your website is mobile-friendly is a must if you want to improve your bounce rate and numerous other metrics. If the text isn’t legible, or the content doesn’t fit the vertical orientation of mobile devices, count on users to bounce off your site. You can test how your website displays on different mobile devices using this free tool. 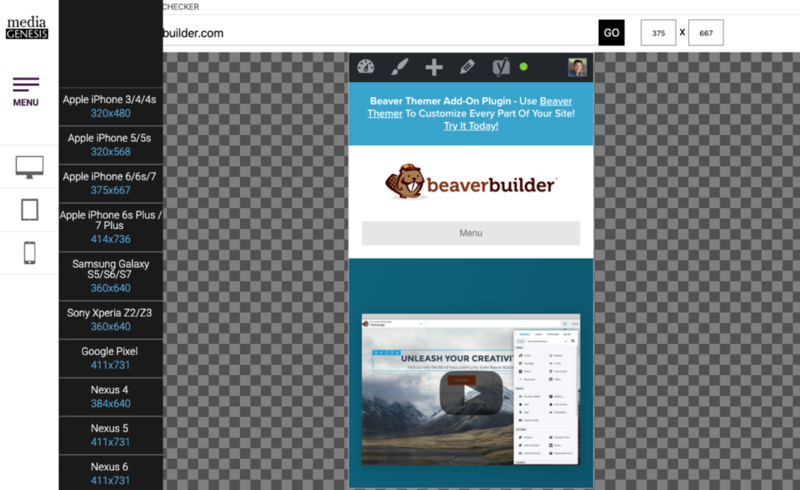 Check out this article to learn how to build mobile responsive websites using Beaver Builder. Suppose the user saw your website’s link in the SERP, got convinced to click through after reading your title and meta description, and swiftly made it to your virtual real estate. How do you keep them from leaving your site? With great content, of course! Not just great text content, but also visual content: images, videos, gifs, infographics, and even memes. Not everyone who lands on your website is interested in reading a huge slab of text. To accommodate your audience’s short attention span, combine your regular text content with visuals in an attractive layout. Video content is especially engaging and can potentially keep your visitors hooked, much more so than merely plain text. Infographics are another great way to present information in an appealing and easy-to-digest manner. Infographics offer an added benefit as visitors are likely to share it on social media sites like Pinterest. In essence, visuals play a big role in increasing user engagement and thus reducing bounce rates. Okay, your users got this far. Now, do you want them to leave your website after consuming your content? You want them to feel at home, to stay and browse around. They won’t do all that without your guidance, so develop a proper internal linking structure. In your articles, link to other relevant blog posts that add further value to your audience. But don’t go overboard with internal linking. It’ll serve no purpose other than crippling the readability and overwhelming the reader, as you can see in the following example. Strategically place beautifully designed calls to action (CTAs) to clearly communicate to your visitors what you can offer them and what they should do next. Beaver Builder does a great job of this throughout their website. They offer large buttons that stand out to help direct you to the next step. By implementing clear calls to actions on your website you can help them click-through and ultimately reduce your bounce rate percentage. Optimizing site speed, offering a variety of relevant content, and building a logical site structure are all actions tied together by a single, broader objective: providing the best possible user experience. Make your site easy to search and its navigation effortless. Display social proof (such as social shares and positive reviews) to boost your website’s credibility. When embedding videos, don’t autoplay them. It’ll drive your visitors away, and some devices and browsers don’t support it. Avoid interruptive popups and ads. Properly structure your content and make it easy to read. Employ white space and minimalistic design. Not only does minimalism look good (and modern), but it also boosts your website’s performance.